A wrought-iron stair railing can lend a look of sophistication to a staircase and provide sturdy support for those ascending or descending stairs, helping prevent falls and injuries. Because wrought-iron stair railings are typically custom-made, you need to determine the length and pitch of the railing before you order it from the manufacturer. Measuring the pitch and length of a wrought-iron stair railing is a straightforward process that requires few tools. 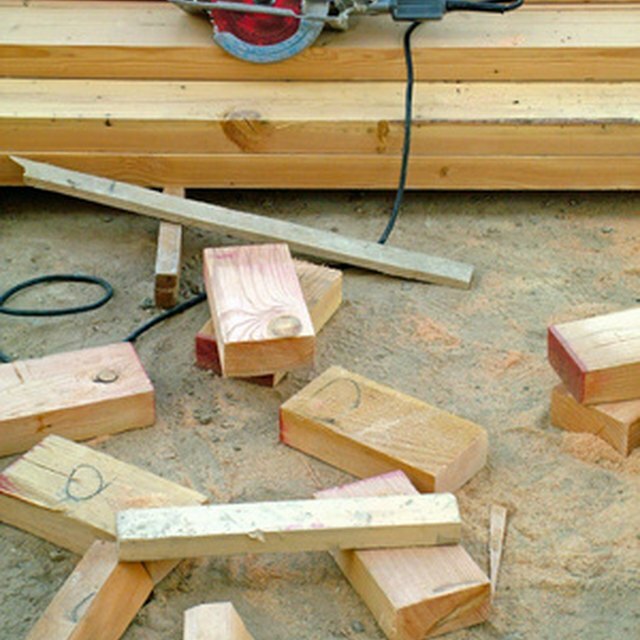 Measure a section of 1-by-2-inch lumber to a length of 36 inches and cut it to length with a circular saw. Stand the lumber section at the edge of the top landing and use a carpenter's level to make sure it is perfectly vertical. Lightly mark the top of the lumber with a pencil. Stand the lumber section at the edge of the bottom step and check it with the level. Mark the top of the lumber section on the wall. The marks represent the height of the handrail. After marking the ends of the railing at the top landing and bottom step, place the end of a tape measure at the top landing mark. Extend the tape measure to the mark above the bottom step. This measurement is the length of the wrought-iron stair railing. The pitch is the angle of the railing and should be parallel with the pitch of the stairs. The manufacturer needs this measurement to correctly angle the brackets that attach the railing to the wall. Place a yardstick on its edge on the stairs against the wall. Put one corner of a carpenter's level on the yardstick and raise the opposite end until it is perfectly horizontal. Lightly mark the bottom edge of the level on the wall. Turn the level vertically and mark the distance from the end of the horizontal line to the top edge of the yardstick to form a triangle. Calculate the pitch by measuring the length of the horizontal line and the length of the vertical line. The pitch compares the two measurements. For example, if the horizontal line is 12 inches and the vertical line is 11 inches, the pitch is 11/12. If you plan to install a freestanding wrought-iron railing rather than a railing mounted to a wall, you need to determine the length of the vertical rails. Use the diagonal mark 36 inches above the top landing and bottom step as the top point of these rails. Measure vertically from this line to the top of each step to determine the length of the vertical rails. Code requires rails be no farther apart than 4 inches.